Granite Dam to the tailrace of Bonneville Dam was 71.3 percent (95 percent Confidence Interval: 49.3, 93.3 percent). Survival estimates for juvenile steelhead moving down through the Columbia-Snake river hydro system during the 2014 spring-summer outmigration were so high -- nearly 10 percent higher than the next best in a data record that goes back to 1997 -- that researchers from NOAA Fisheries' Northwest Fisheries Science say they need to review their statistical modeling methods and assumptions. "It is possible that our survival estimates for migrant steelhead accurately reflect true survival rates that were exceptionally high in the lower Columbia River in 2014," according to a Sept. 18 NWFSC memo citing "preliminary estimates" of survival of PIT-tagged juvenile salmonids passing through reservoirs and dams during the 2014 outmigration season. "However, we do not have a good explanation for actual survival being so much higher than average in 2014; environmental conditions were average, dam operations were similar to recent years, and yearling chinook survival was only average," according to the memo from NWFSC Fish Ecology Division Director Richard W. Zabel to Ritchie Graves, head of NOAA Fisheries West Coast Region Columbia River Hydropower Division. The annual survival report, which will be updated and finalized by year's end, has been prepared annually since 1993 as part of NOAA's overall assessment of well-being of salmon and steelhead stocks that are listed under the Endangered Species Act, and how various hydro operational and structural changes might be benefiting the fish. The preliminary report as always cautions that "the database between time of our annual summer memo and the publication of our final report may result in differences of up to 3 to 4 percent in estimated survival values." That adjustment range could be tested this year. 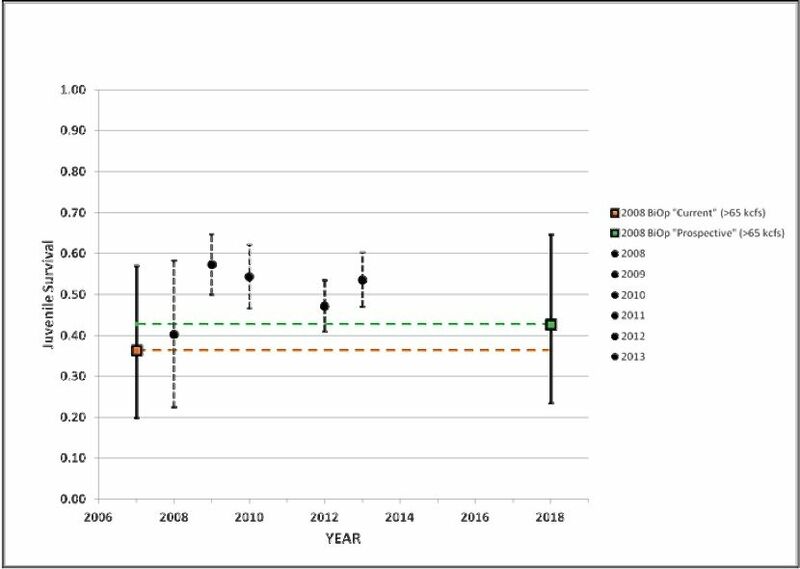 "For steelhead in 2014, estimated survival through the hydropower system was 77.1 percent, which was considerably higher than the long-term mean of 45.7 percent and was the highest estimate in our time series (1997-2014; Table 5)," the memo says. That estimate is for the entire system from the head of Lower Granite reservoir down to Bonneville Dam's tailrace. "This 2014 estimate was 27.0 percentage points higher than the estimate from 2013 of 50.1 percent. . . .
"A much higher than average estimated mean survival from McNary Dam tailrace to Bonneville Dam tailrace (102.3 percent vs. 68.3 percent average) contributed most to the high estimate for the hydropower system. Estimated survival from Lower Granite Dam tailrace to McNary Dam tailrace was also higher than average (74.0 percent vs. 64.5 percent average), and was the fourth highest estimate in our time series for that reach," according to the memo. "The 2014 steelhead hydrosystem survival estimate of 77.1 percent and, especially, the estimate of 102 percent survival in the lower Columbia River (McNary-to-Bonneville Dam) are of particular interest." The memo notes that, for technical reasons, the statistical model for survival estimations can produce estimates that exceed 100 percent "but for practical purposes these estimates should be considered equal to 100 percent." For the survival studies, which are funded by the Bonneville Power Administration, NOAA Fisheries PIT tagged more than 20,000 river-run hatchery steelhead, 14,500 wild steelhead and nearly 18,000 wild yearling chinook for the release into the tailrace of Lower Granite Dam, which is located in southeast Washington on the lower Snake River. Survival estimates provided in the memorandum are derived from PIT-tag data from fish PIT tagged by or for NOAA Fisheries, as described above, along with fish PIT tagged by others within the Columbia River basin. "Low detection probabilities in 2014 at the series of detection sites in the lower river (approximately 0.11 at each of McNary, John Day, and Bonneville Dams, and approximately 0.02 at the estuary PIT-tag trawl) resulted in high standard errors (poor precision) on survival estimates," the memo says. "While large sampling error alone could explain a high survival estimate for McNary-to-Bonneville, it is unlikely that sampling error alone accounted for the pattern of exceptionally high estimates in both of the sub-reaches, even if actual survival were high. "It is likely, then, that the very low detection probabilities combined with violations of model assumptions to cause bias in estimated survival in the Lower Columbia River reaches. "Varying patterns through time in dam operations at successive dams can also cause biased estimates. We are investigating the potential occurrence and degree of effect of violations and will present results in our annual report. "In general, conditions in the Snake River during the 2014 spring migration could be categorized as average flow and temperature with above average spill percentages. These conditions are similar to those that occurred in 2009," the preliminary report says. For Snake River yearling chinook salmon in 2014, estimated survival from the Snake River trap to Bonneville Dam tailrace was 49.7 percent, which was the eleventh highest out of 16 years with observations (1999-2014), and nearly equal to the long-term average of 50.1 percent. The memo says that survival of PIT-tagged yearling chinook salmon released from upstream hatcheries in 2014 had mean survival of 71.4 percent from release to Lower Granite Dam. That was the highest in the 22 years of the study (though not statistically significantly higher than most other years). The minimum observed mean was 54.8 percent, in 2005. Hatchery fish were from seven Snake River basin hatcheries -- Dworshak, Kooskia, Lookingglass/Imnaha Weir, Rapid River, McCall/Knox Bridge, Pahsimeroi, and Sawtooth -- every year from 1993 through 2014 (except Pahsimeroi in 1996). Across these "index" hatcheries, the annual mean estimated survival from release to Lower Granite Dam has been relatively stable since 1998. Juvenile fish from upstream must pass Lower Granite and seven other dams on their way toward the Pacific Ocean, unless they are corralled at one of three Snake River dams (Ice Harbor excluded) or McNary on the Columbia and transported downstream aboard, principally, barges. The statistical analysis of reach to reach and overall survival stretches from the Lower Granite trap at the head of that dam's reservoir to below Bonneville Dam, which is the lowermost hydro project in the eight-dam system. Estimated survival in 2014 of Snake River sockeye salmon (hatchery and wild combined) from the tailrace of Lower Granite Dam to the tailrace of Bonneville Dam was 71.3 percent (95 percent CI: 49.3, 93.3 percent; Table 7). That was the second highest on a record going back to 1998. Estimated survival in 2014 of Columbia River sockeye salmon (hatchery and wild combined) from the tailrace of the mid-Columbia's Rock Island Dam to the tailrace of Bonneville Dam was 24.2 percent (95 percent CI: 2.0 percent, 46.4 percent; Table 7). That was the third lowest on record.